Luna Meadows discovered her vocation as a weaver in the weeks following an accident that required a long recovery accompanied by some question concerning the degree of mobility that Luna would retain. In her weaving, eighteen-year-old Luna found a way to express her fears about the future and her anguish over the death of Sierra Caffey, her best friend. Ten years after the accident that claimed Sierra’s life and left Oscar Gaitlin, Sierra’s boyfriend, in a persistent vegetative state, Luna’s hand-woven, story-telling scarves have become a favorite accessory of celebrities and earn their creator a lucrative living. Still, in some ways, Luna is still frozen in the aftermath of the twin accidents a decade after they occurred. She lives in her parents’ home, and she is haunted by the secret she holds. But she has decided that it is time she makes some changes in her life. She buys a loft that gives her living space and space for her loom and makes plans to move out on her own at last. She also sets up a non-profit and purchases Sierra’s home with plans for turning it into a community arts center in memory of Sierra and Oscar. Sierra’s death devastated her parents, and two years after the accident, they moved to Mexico with their four younger children, leaving behind their house filled with the accumulated stuff of a family’s life. On the anniversary of her friend’s death, Luna enters the house to begin the task of clearing it for the necessary renovations. She is prepared for the memories that will assail her, but she does not expect the appearance of Angelo Caffey, Sierra’s older brother and Luna’s first love. Angelo hasn’t been back to Hope Springs, Texas, since he left eight years ago. He never planned to return to the place where he lost not only his oldest sister but also the family who disowned him. Like Luna, an accident that happened ten years ago still has a heavy claim on him, as do his memories of Luna, the girl he left in Hope Springs. Angelo knows that Luna possesses more information about the circumstances of Sierra’s death than she has revealed, and he wants answers. He strikes a deal with Luna: he will work with her for five days cleaning out his family home, five days during which he will probe and push for the full truth about a day that changed both their lives. Her self-protective instinct tells Luna that she should refuse Angelo’s, but her heart prompts a yes. As Luna and Angelo tackle the job of cleaning the house, they are confronted at every turn with the past that both unites and divides them. The feelings they shared as young lovers were powerful, but they were too young then to protect what they had from the forces that separated them. However reluctant Luna and Angelo may be to admit it, the physical attraction and the emotional connection between them remain strong even after eight years with no contact. But the secrets and half-truths have to be revealed before the wounds of the past can heal and the hope for a future together can be realized. 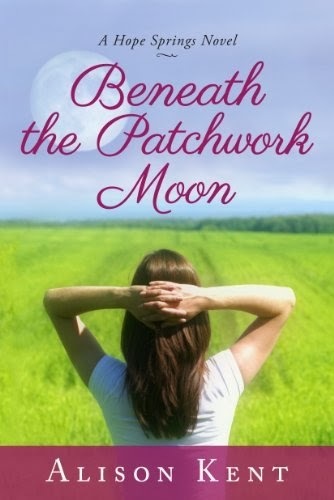 Although Kaylie Flynn and Tennessee Keller, the heroine and hero of The Second Chance Café, the first book in Kent’s Hope Springs series, appear in this second book, Beneath a Patchwork Moon can easily be read as a standalone. The focus is clearly on the tangled relationship of Luna and Angelo, two complex, creative characters unable either to let go of the past or to make peace with it. Setting is less important in this second book than it was in the first, although there are enough details such as the class distinctions and the community efforts to offset the funding cuts to arts programs in public schools, to make the reader aware that Hope Springs is a small town. There is a pervasive melancholy in this novel that not even an HEA completely overcomes. The tragedy and its shattering effects cannot be undone even as some survivors find that happiness is still possible for those marked by loss. This is romance, strong and satisfying romance, but it is romance with a realistic edge. There are no magic wands or happy pills in this story that resurrect the dead or make whole everything that was broken. Some readers may find this a problem; other readers will find that it adds to the story’s emotional power. I belong in the latter group. The Hope Springs series is typical in one respect. The town is peopled with fascinating characters who leave the reader longing for their stories. The Sweetness of Honey, the third book in the series, is the story of Indiana Keller, Tennessee’s sister, introduced in The Second Chance Café, and Oliver Gaitlin, introduced in Beneath the Patchwork Moon. It will be released October 14, 2014. That leaves at least the mysterious Will Bowman and the missing Dakota, the third Keller sibling. I’m keeping my fingers crossed that I will be making several more visits to Hope Springs. I loved the previous book and look forward to reading this one. Pat, I loved the first one too. I think it is rare to find books in a series that are as different as these two are, although both are excellent. The second chance theme also unites them. I anticipate that theme running through the series. I also enjoyed the role the heroine's profession played in the first two books. Both the baking and the weaving are traditional female skills that are often not viewed as creative gifts. I love that Kaylie and Luna are both artists in their different ways. I love Alison's books and can't wait to read this new one. I love Alison's books also will put it on my tbr list.. Thanks again for another informative review. This sounds like a book i need to read. I enjoy romances, but prefer the ones where everything does't end perfectly. Life rarely has perfect happy endings and it doesn't hurt a romance to accept that and deal with it. It isn't realistic to have all the threads of a story or life neatly wrapped up perfectly. It is nice to see there can be a satisfying resolution to a relationship without the rest of their lives being perfect and the way they would want them to be. I appreciate Ms. Kent giving us a satisfying story that deals with life as it too often is.